Last March, I rode my motorcycle from Amsterdam to Marseilles and back (around 3,200 km) without seeing very much advertising on the way. I didn't miss it. I also didn't run out of gas, get hungry or lose my way -- so you can't argue that I needed ads for "essential" information. Advertisements give consumers information they need about a product. Hahaha. Advertisements range from optimistic to outright lies. Banksy says it better. Advertisements help consumers choose among products. No, they produce confusion (flattering apples vs disgusting oranges ) or waste (the political lobbying arms race will cost $billions this year in the US). Advertisements represent freedom of (corporate) speech. This is neither constitutionally sound (corporations are NOT people where the First Amendment is concerned; Citizens United was a disastrous decision) nor relevant when it comes to selling goods (rather than expressing one's views on public policy). But what would happen if we banned advertising? Organizations evaluating consumer products (e.g., Consumer Reports or Underwriters Labs) would get more attention, word of mouth would drive sales, and many "impulse purchases" would not happen. In fact, I bet that overall consumption would fall, as people made fewer "wrong" purchases (due to deception), fewer "over" purchases (due to advertisements promising a better life for buying product X), and fewer "matching" purchases (to keep up with all the crap your neighbor has, from the McMansion to the third car). Would that be worse for us? for society? Probably not. Would it be worse for capitalism? Not for those who offered value for money. Would it be worse for liars, shysters, late-night sellers, and other sellers of dreams-in-bottles? Yes, definitely. The consumption component of GDP might fall by 20 percent. Would that be bad? Probably not in terms of jobs (people would work elsewhere), happiness (for both consumers with less crap and workers selling products they DID actually believe in), or the environment (lower consumption is better). What would we see instead? New products would gain market share gradually as people recommended good products to friends. Bad products would get no market share unless they listened to customers and adapted. Local brands could sell value instead of submitting to the onslaught of flash. The best defense for products -- new and old -- is to offer a real improvement, not an advertised improvement (New! Bolder Packaging!). Politicians lacking attack ads and flattering hagiographies would have to confront each other in public debates or other personal appearances. People would read news stories and talk to each other to understand more about candidates. Print and TV media would hate this, of course, but now they can earn money from cable or satellite subscriptions. They would also have to serve viewers instead of politicians with big budgets (some governments indirectly control the media via advertisements -- or worse). Could the government ban advertising? Yes, since they already regulate what is said on packaging, advertisements aimed at children, advertisements on roads, etc. In fact, governments would be doing us all a favor by banning advertisements, since a ban would remove the need for producers, politicians and providers of services to compete in the race to put their best lie forward. They could instead concentrate on winning loyalty the old fashioned way: by providing value to us. Bottom Line: Advertising produces little of value for society. We should experiment with banning it in some places, and then consider banning it in all places. Single example of useful highway advertising = I-95 on the East Coast of the US in North Carolina. As folks drive south to the beach, generations of kids have been amused by the "South of the Border" billboards. what constitutes an ad? is this blog an ad for aguanomics the book? should this book be banned? the subsidy value of advertising should not be overlooked. to say "let's ban advertising" is another way of saying "let's raise the price on a lot of things." my favorite example: google maps. i also reject the notion that ads are entirely void of value. classified ads? valuable. if a person pays for an online dating site, are they not paying to advertise themselves? if someone found the love of their life that way, that might have been a pretty good ad for all parties involved. bansky's belief that ads are an assault on the viewer goes a bit too far, in my opinion. how about a building that someone built and paid for -- is that an assault on me too? how about a waterway that blocks me from walking and that i'm forced to look at -- is that an assault i should destroy if i feel like it? @mac -- I don't have the faith that you do, about "the market" flushing out bad adverts. Indeed, the $billions being spent on political ads (not to mention product ads) contradicts your theory. Sorry, there's no EMH here. @Simit -- You've mastered the non-sequitur, I see. Why ban a book? What makes you think that an "objectionable building" (and property rights!) has anything to do with ads in magazines that sell crap? Try again. Your examples of classified ads and online dating miss my point. Classifieds are not placed to change people's opinions. They are "for sale" notices. Same as online dating. Your example of google maps (and gmail, for which I'd be willing to pay but do not have to, due to their advertising revenue model) is better. I'm saying that I don't mind paying a subscription for the maps. Would you now? Would you if directions started to direct you to McDonalds instead of the restaurant you choose? Think about it -- who's the customer? @all -- try again. This time, tell me which advertisements you WOULD ban, unless you think that ALL ads are good. It's not a non-sequitur. You missed the point, "Who decides what is an ad?" And how big is the agency going to have to be that decides, on a case-by-case basis I presume, which the tens of millions of possible ads are legal and which are illegal? Hmm ... valuable advertising. New movies. New books. New products of any sort. Innovation of any kind at all, really. Or maybe we'll just start wandering around the store and find all the really cool stuff. The crucial issue is not advertising. It is that people buy stuff that is advertised. 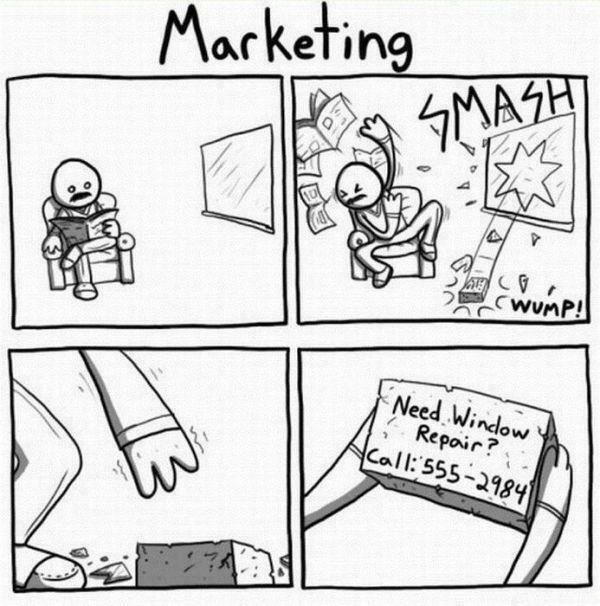 Meaning advertising makes money. Meaning maybe you should focus less on regulating the industry (which has a long history of RAISING lobbying costs, etc) and more on educating the public. When advertising doesn't make money, it goes away. I think that, as advocate for a fairly serious regulation (banning ads), your burden of proof is far far higher than that. Where is the market failure? Where is the externality? Would banning ads work, or simply push them into celebrity endorsements, product placement, 'news' stories, social media and [worst of all] door to door sales? How would new productivity-enhancing technology be spread through the economy? Are consumers so completely irrational that they must be prevented from willingly entering transactions that may have been influenced by ads? @Josh -- Your non-non-sequitur question is good. Who decides can be decided at many levels. No billboards, ads on cars, etc. by the government. Magazines and TV stations can make their own choices or be regulated. New products? How did people 'discover " them before ads? By word of mouth. I just watched a 2007 movie based on that. Is it a tragedy that I waited 5 years? Not if $ goes to the creators. We have a "big bang" model for movies in the US (first week boxoffice is IT)due to the advertising wars. "Education" -- like "people need to be different" -- is not a solution, as we have to deal with the tools we have now. Just a question: Do you think current political ads are improving peoples' decisions for the elections? @Anon -- Yes, there's a burden of proof, but I am looking for ANY argument in FAVOR of ads, in terms of the public interest. What's yours? @All -- Would you ban ANY ads? Why are ads to children banned? Alcohol on TV? How about political ads? Are they good? Your 'counter-example' of political ads prove the point. My point: if ad efficacy wanes, firms will advertise less or differently. Here's the rub-- political ads, notably negative ads (that people say they dislike)..WORK.. These ads work. When/if they stop working so well, campaigns will shift tactics. My point was that as ad effectiveness declines, advertisers will shift. In US politics, there has been no such decline. I'd say government could reasonably ban advertising for illegal goods that jeopardize public safety. Government could ban libelous claims. Having advertising, as a means to inform free choice, is itself a public good. Society can make better decisions. Sure, people have to wade thru some misleading ads and the 'market' would take time to learn and reward those advertisers who are the real deal-- but why deny firms/groups the ability to do that? I can understand if some areas do not want billboards, for aesthetics. fine- i agree. but where billboards are allowed, what's the market failure that compels government intervention? @mac -- no I didn't think of it in a coffeeshop, but we wouldn't have these problems if more people smoked pot instead of lying for a living. Attack ads "work" because people believe lies that back their prejudices (e.g., birthers). There are two solutions: stop feeding the beast or assume people will either get smarter or care about the truth. I am not as optimistic as you on the latter. You give an example of "wading"... as if it is a costless process. What you are saying is that it's ok for the USPS to dump junk mail (incl mail labeled "personal and confidential) in your mail box. Do you think that wading is costless? Do you think that spam in your email is costless? What about for the people who lose their money? I am not proposing a heavy govt body that needs to make judgements. I am proposing a ban. Those are cheap -- as you see with the ban on alcohol ads on TV. Your assumption about innovation is false, as the gain from sales FOR 100% TRUTHFUL ADS only represents a shift forward on sales. Lying ads can sell more goods (on the margin), but only at the expense of consumers. Oh, and please find me one of those honest ads. One of the ads that honestly compares two products for the customer's benefit. Most ads, you will agree, present the product's "best face." @mac (billboards) -- so you like billboards and I like trees. What's your policy on public pollution? Ok with you? Suffering "on the way" (via a state monopoly) is a form of market abuse. Does that mean you support monopoly rents? The "establishment" is NOT out of business b/c ad $ goes to one group (land rents) and costs go to people like me. Classic externality for which total (social) costs > private benefits (not even including deception, right? Remember "doctors who smoke prefer Camels"? Lots of cancer from that campaign, but now we see it as deceptive and harmful. Same thing with Pepsi, iPhones, Weight Watchers, Prius, Lady Gaga, etc. I am not for banning commerce. I favor fewer impulse buys based on biased ignorance. My first reaction is that any benefit from restricting advertising beyond widely accepted prohibitions on fraud is that the inevitable restrictions on speech (especially as people nibble around the edges of vague legislation) will be far outweighed by the erosions of our freedoms. My second reaction is that you have spent too much time in Yurp. @Kurtz -- Although we agree on freedom of speech as a fundamental right -- and foundation of society -- I disagree that ad-subsidized media is either necessary or conducive to free speech. Second, I do not think that "third party" advertising (i.e., not on the product or store selling the item) adds value to consumer decisions (due to its biased nature) at the same time as it's a blight on our landscape (yes, that's me in Europe, where nice views are more the norm than the exception). Third, I think that advertising in political campaigns is value subtracting. Debates, opinions and editorials are one thing: "manufactured ideologues" are both misleading and dangerous in front of an electorate that thinks with its gut instead of its brains. Take away the already-illegal fraud angle, and this is merely a complaint that others don't share David's utility function. In the case of a market-oriented economist, this warrants a double face-palm. The arguments about political advertising are red herrings, because politics is (by definition) about coercion. There are arguments to make about aesthetic externalities as a form of nuisance, but David doesn't make them. I'd like to implement all-in water auctions in my water district, but now I feel a sudden need to scrutinize the math and logic in David's case for them. @Brian -- The burden of fraud lies with the prosecution, but ads avoid fraud my omitting relevant information (benefits but not costs). I am -- as you did not perhaps detect -- worried about market failure here. Just as a reminder, that means that people are making poor decisions due to a lack of relevant information or proper assessment of costs and benefits. You will agree, I am sure, that this is a problem with pollutants (that are regulated) and I am saying it's the same with advertisements. On "political ads as coercion" you are saying the coercion is something that we should allow and encourage? Interesting. I agree abut aesthetic externalities (see above). I'm glad to help you will All-in-Auctions but don't worry about the math, since there is none (there's accounting, at most). My point about coercion is that the market failure relevant to political ads is even more fundamental: politics isn't about markets. Complaining about the quality of information markets about political choices is like complaining about the quality of information markets about what Mafia family to pay protection money to. "Pollutants" seems like another red herring, invoking externalities that are presumably not your target here. I think you meant something like "contaminants"/"tainting". Such market failures are already subject to legal recourse. Often, too much recourse. If the harm from advertising were as demonstrable and objective as you claim, schools of tort sharks would have already swarmed onto the case. I still don't see how this isn't a case of wanting the nanny state to legislate your personal utility function. By my own utility function, "a proper assessment of costs and benefits" would outlaw nicotine, caffeine, body art/piercings, expensive art/jewelry, etc. We get it. You're signalling that you're embarrassed by the consumerism that free markets unleash. Signal received. The irony is that your freedom to signal is being used to demand that men with guns take that freedom from others. @Brian -- you're mistaking "freedom of expression" (your view) with "freedom for abuse" (my view) -- it's the difference between eating junk food and dropping the garbage on the ground. 1. If you have a commercial adress, you can have your own logo (or sub logos like in "Iguatemi Shopping, we have a MacDonalds")displayed. There´s a size limit on how big your logo can be, that varies on how big your business is (literally: how big it´s the building). 2. Some historical landmarks, like the Itau clock, a bank´s clock that´s almost a hundred years old, were given special permits. 3. A few small (about 50 square centimeters) ads are allowed, in return for the emprise financing a public service. For example: an emprise mantains a park, it may place one of those ads. This worked very well in our city. There was no finantial turmoil (well, a few grafic enterprizes specialized in outdoors had a bad time, but they adapted). Visual pollution got away, and a lot of historical buildings were visible again. The ad-limiting law was followed by a law that aided historical buildings owners to restore the buildings exterior (diminishing taxes for that purpose), so that the buildings, that were initially in a very bad state, were restored. The city became more beautiful, huge enterprizes started to compete between themselves to keep parks, and the city vistas, which are also an public asset, were preserved. The mayor responsible for those laws was reelected. It DID work good around here. This was NOT a total ban in advertising, but then again, a ban like that would not be needed. Ads in a newspaper or magazine, for example... maybe there could be "premium" versions of those, without the ads, like in websites. Or maybe that wouldn´t make economical sense, as there would be a whole new printing job to do the adless version, which would drive prices even higher. I would not pay for an ad free version of most magazines and newspapers that I read, because I like the ocasional unintended jokes (then again, one of our biggest jewelleries here in Brasil is named Vivara, which would translate to "See *ick" so ads here are incredible funny...). I would pay more for an ad free cable TV, though. Outdoor ads, though, are another matter. They intrude in the view without the consumer choosing it. You can choose not to see TV or to read a newspaper or to see a magazine. You can jump the ads. But outdoors are there, intruding in your view. That´s why (one of the reasons of, actually) I voted for the reelection of the mayor that regulated ads on my city, and I´ll vote for the candidate this mayor is promoting in the next election.